This is the early stage of a drawing study I’m working on now. It’s based on a photo of mine that I took of a figurine from a traveling museum exhibit several years ago. Unfortunately, I didn’t make a note of the sculptor. All I can remember was that he was French, probably late 18th century. I think this sculpture was called “Spring,” and she was rather small, under 2 feet tall. Quite lovely. 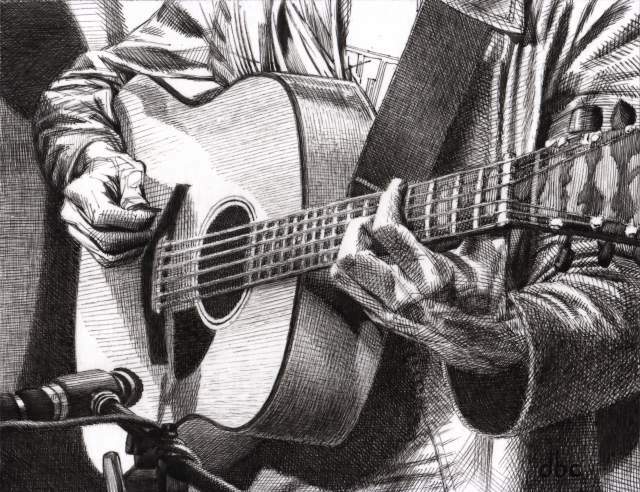 This is a detail of the drawing which will be of the whole figure on 12×16″ paper. It’s a plate surface which is giving me more trouble than I expected (Strathmore Bristol,) but I wanted it smooth so I’ll just deal with it. I’m using oil based pencils from Walnut Hollow, gray and black. They have a nice smooth feel to them as they draw. Here’s something a little different. I dug up these two old studies from storage today. 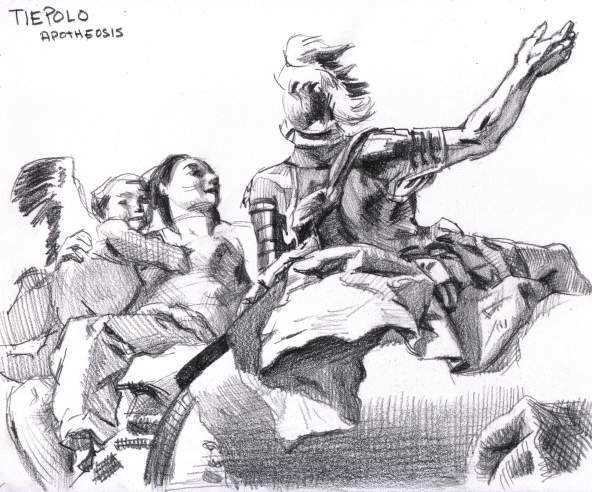 They’re based on a book I had (now lost unfortunately) of artwork by the great 18th century Venetian artist, Giambattista Tiepolo. Both are around ten years old, in pencil. 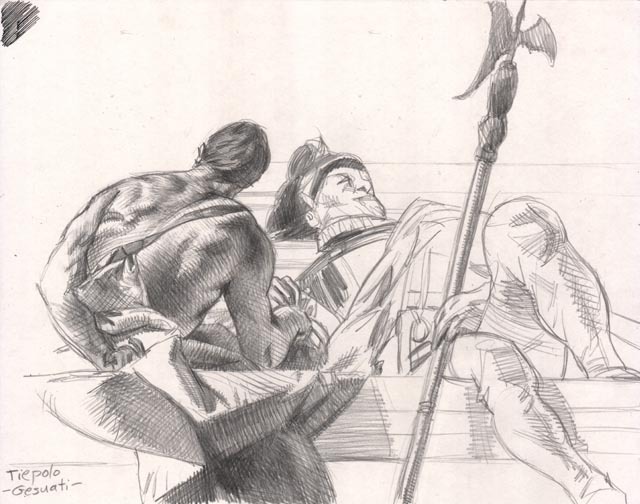 The first drawing (8.5×11″) is a detail from his Apotheosis of Spain mural, and the other (11×14″) is from the Gesuati ceiling. He has always been one of my favorite artists. Here are a couple pencil sketches I made recently while waiting at an insurance office. The first one was drawn with a mechanical pencil (Sanford “Turquoise” HB lead) and the other was quickly sketched out with the mechanical pencil, then finished mostly with General’s Kimberly 8B. Both are on 8.5×11″ paper. I thought I’d take a moment to present some of my favorite pencils. Not all of them are made of graphite. The soft graphite leads (HB to 9B) have a different feel to them in terms of hardness and how they react to the surface. The dark of an 4B will be equal to that of a 9B, but the softer leads require less pressure and leave more residue. There are, of course, harder lead pencils that contain clay and will make lighter marks even with firm pressure. Notice in the image below where a 6B lead was drawn over marks by a 4H, and how the 4H resists the softer lead. Being that graphite is a form of lubricant, darker areas will reflect light and look shiny. 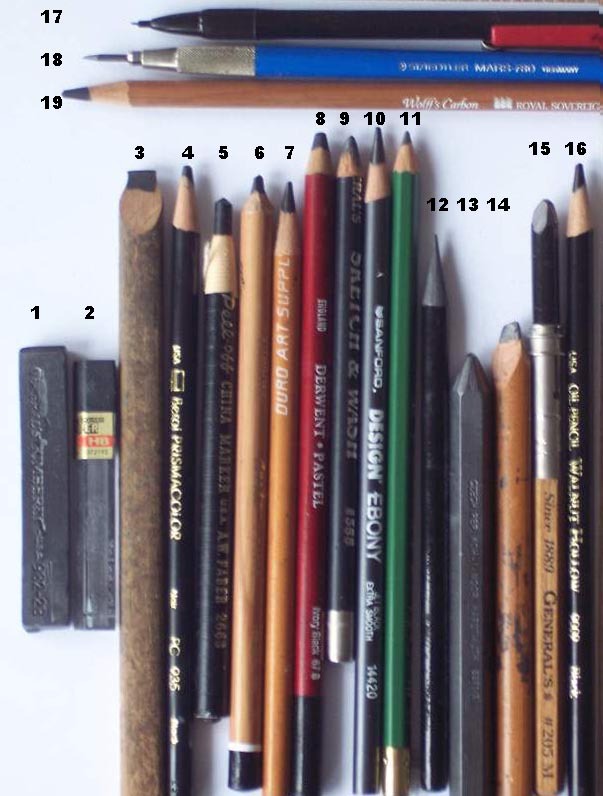 The “hybrid” pencils mix things like compressed graphite and charcoal, or pigment with various binders like wax, or oil and can make darker marks. An advantage that the Prismacolor and Walnut Hollow pencils have over the others is being able to hold a sharp point better. Another brand of oil pencil is Faber-Castell’s Polychromos which doesn’t contain wax. 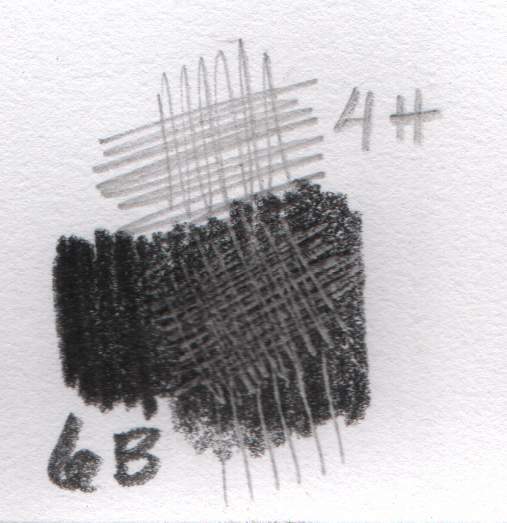 The carbon pencils like the Wolff, Conté, or pastel pencils can be slightly powdery, as you might expect. My favorite of the dark pencils is the Wolff brand, which offers 4 choices of softness. The Conté carbon pencil 2B appears to be a little lighter in value than the Wolff 2B. Another charcoal & graphite (a.k.a. “carbon”) pencil brand I like is Lyra’s Rembrandt Carbon (not shown,) which perfoms like the Conté. General makes a nice carbon pencil also. Other hybrid pencils that seem equally dark are the China Marker (oil,) Walnut Hollow (oil & wax,) and Prismacolor (wax.) The Derwent pastel pencil also draws very dark, but the tone seems slightly more bluish than the others. Notice how these pencils erase in the example above. The China Marker, not surprisingly, won’t budge, but the others erase somewhat cleanly. The “Turquoise” lead is the easiest to erase. The eraser used was a “Factis” Black #18 from General. 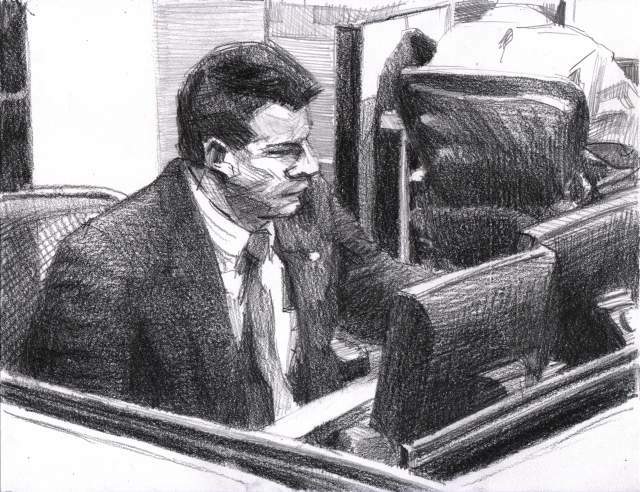 The surface quality of the paper also has much to do with how the lines will draw with each of these pencils. What I particularly like about the Derwent AQUAtone pencils, and a few of the other types, is that they are woodless, making them more economical and less wasteful. The watercolor and pastel pencils are also useful when starting a painting. Microscopic slivers of sharp graphite could actually slice up into the paint surface, but these are made of pigment and are more compatible with the painting medium. They’re also handy to touch-up water mediums like gouache or casein. 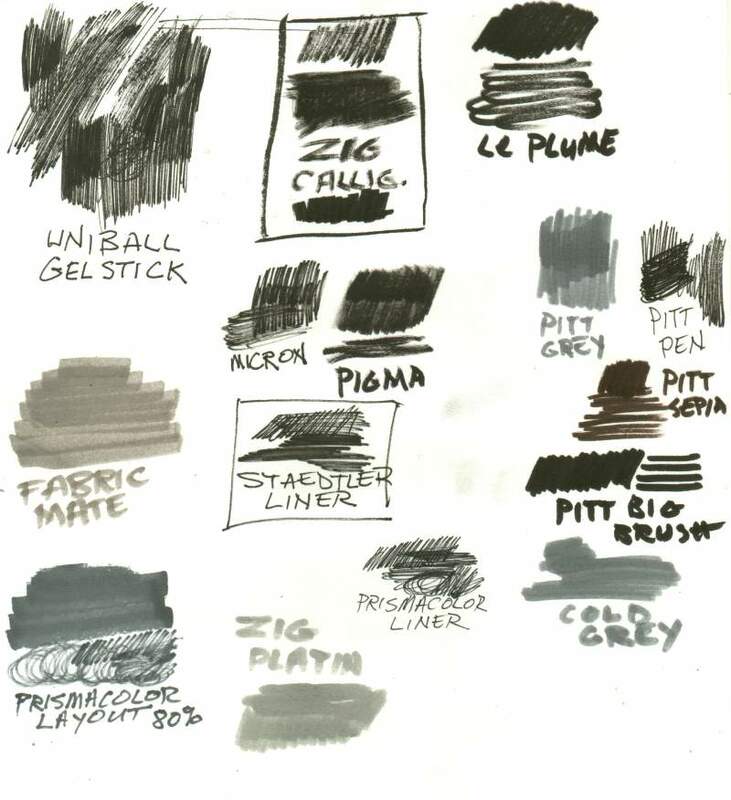 The blacks of these watercolors fall between the carbon and graphite leads in value, but don’t draw as smoothly. 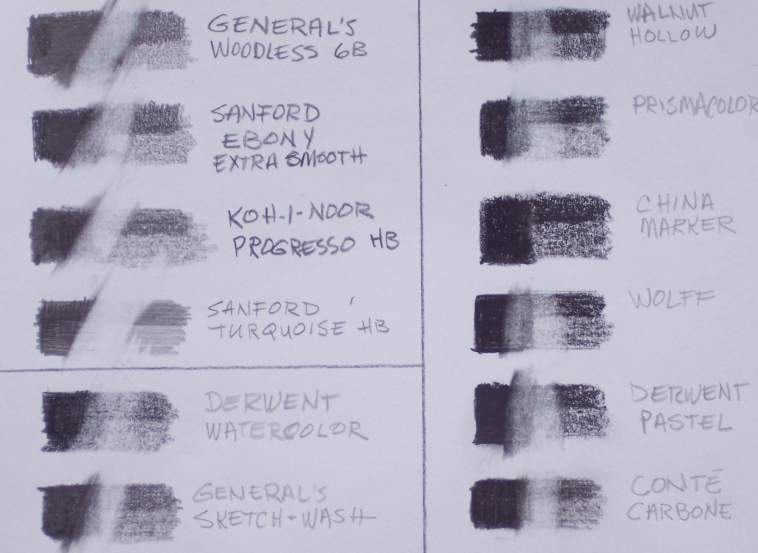 *General’s Sketch & Wash is technically not watercolor but graphite and a water-soluble binder, and does draw smoothly. The Faber Castell and AQUAtone pencils flow more easily than the others. Leadholders help make better use of pencils as they get smaller, and keep your fingers clean, but not all pencils fit all holders. The best design of these are the mechanical pencil holders like the Staedtler above, where you only need to replace the lead. A shortcoming of thin mechanical leads (like these Pentel .5mm) is they break easily, and you must constantly “pump” them up the holder as you draw, but their advantage is not needing to be sharpened. That makes them good for sketching on location. The Staedtler holder is handy on location too for shading larger areas, but I need to carry a small piece of sandpaper to keep it sharp. One tip I hear about keeping your points sharp is to draw at a lower angle to the paper. It takes some practice to control the pencil this way, but it essentially will sharpen the pencil as you draw instead of dulling the point when the pencil is at a higher angle. Personally, I find it simplier just to sharpen the point. Three or four years ago I came across a package of Multimedia Artboards at a local hobby store. The label sounded interesting, proclaiming them to be made of acid free paper that could be used for oil painting without the need for priming. As you can read on their website, the product is a mixture of paper (wood pulp) and epoxy resin. The resin makes them stiff and harder than regular paper, and also impervious to the damaging effects of drying oils (based on their own tests,) but with enough absorbency to be used with aqueous mediums, and a textured surface for drawing. If you bend them too far they will actually break, similar to what will happen to wood veneer or thin plastic. They are less absorbent than regular paper, but even if you soak them in water they will not curl or buckle. They can be easily cut with scissors, but a sharp thin blade, like a box-cutter, cuts them more cleanly. Because they’re thin, they need to be either framed under a mat, or mounted to a firm support with any type of strong adhesive. They’re available in either black or white, and the white is very bright. One side is rougher than the other, giving you either a cold or hot pressed paper texture option with a single sheet. They are sturdy enough for outdoor use, not easily damaged, and easy to store. If you use it on a light-table, they’re thin enough for dark drawings underneath them to show through, which makes it a good substitute for illustration board. The available sizes run from 8×10″ to 30×40″. Oils and acrylics adhere to this surface extremely well. If you like painting on smooth wood panels, this will feel the same. Wet washes of watercolor or gouache can bead up on the first coat, so I typically prime them a bit with diluted gum arabic, or just work the colored wash into the surface some with the brush. The only medium I haven’t used on it yet is egg tempera. 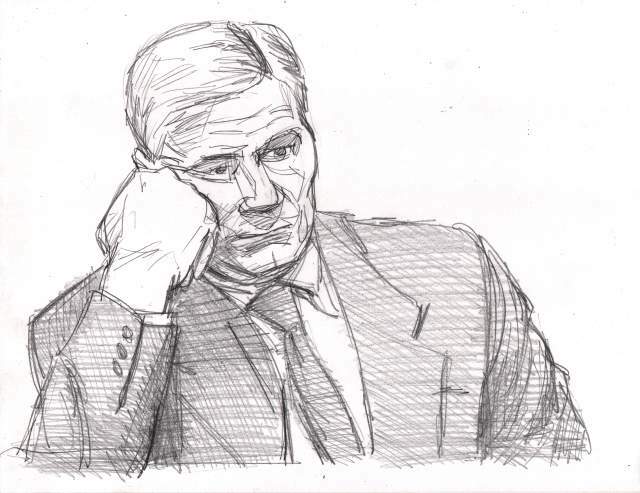 Graphite draws on this very well. One thing I’ve noticed is that hard leads like a 4H seem to make darker marks on it than they do on regular paper, and don’t erase quite as well. You can see an exampe of this on the above image with regular paper underneath the Artboard. Soft pastels, oil pastels, wax pencils all work fine. It’s for inking that I particularly enjoy using these papers, since the ink lines can be easily scratched clean with a sharp blade or needle. The image above shows examples of this using various types of inks. The side of the knife can also be used to lighten the value some. 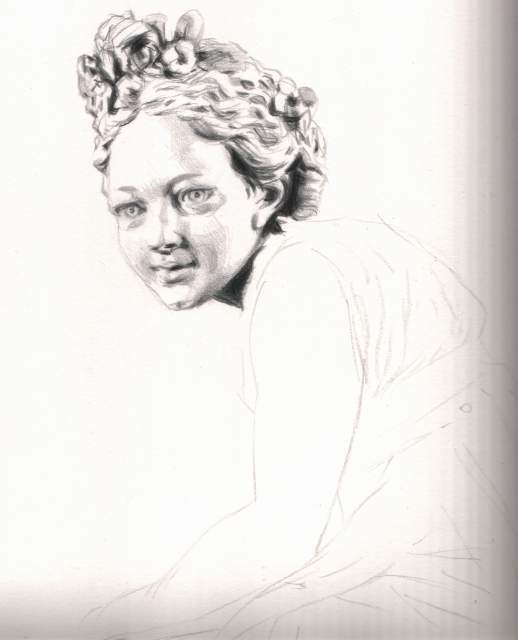 This will not badly damage the paper, which allows for corrections or a sort of scratchboard effect. Ink markers draw well on them too. I have used this surface many times for several years now with a variety of mediums, so I thought it was as good time to share my opinion: I like it. Well, this is interesting. About 3 months ago I decided to start a personal lightfast test of various ink markers I had on hand. I often test my paints this way by taping a sample sheet on acid-free paper or canvas to a South-facing window in direct sunlight for 6-12 months to see how well the pigments perform. I thought I’d do the same here with the markers to see how they held up. This is 100% cotton rag paper about 8 x 8 inches. 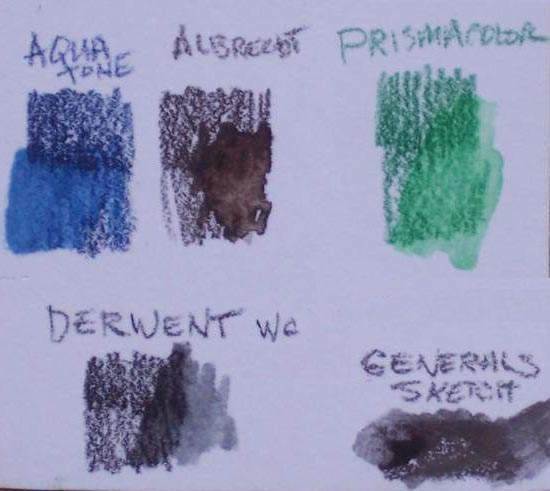 I was almost certain the Y&C Fabricmate marker would fade right away since it’s labeled as a dye, and likely that the Prismacolor Premier layout marker would also (bottom left,) but after comparing these to an identical sheet made at the same time that had been placed in a drawer, I can see no signs of fading in any of these. I have some old sketches and concept boards made with Prismacolor markers that are very faded, so perhaps they’ve improved them since then. A bit surprising but good to see. I’ll continue to monitor this for a few more months. First, my appologies for being absent of late. I should make it a New Year’s Resolution to post more frequently, but I never seem keep them. I will try to be more regular, nonetheless. I have been doing some drawing, however, and here’s a new one. It’s an ink drawing based on a recent pencil sketch. The surface is Multimedia Artboard, 8.5×11 inches. The ink used this time is Daler-Rowney FW Acrylic ink, drawn with a Nikki No. 5 nib. The #5 is very much like their “G” nib but a little smaller. 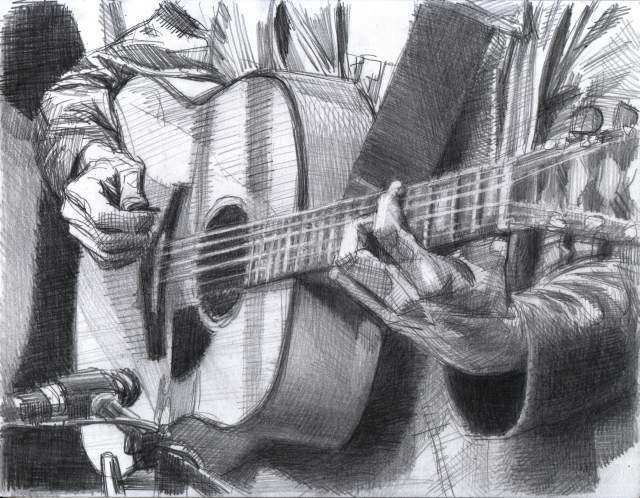 You are currently browsing the Artwork by D. B. Clemons blog archives for January, 2010.